Repeats every week until Tue Apr 30 2019 except Wed Sep 19 2018, Wed Nov 21 2018, Wed Dec 26 2018, Wed Jan 02 2019, Wed Mar 20 2019. Improve your reading skills and make a new friend by reading to Oreo. Oreo is a certified therapy dog who is eager to listen to children read and help them discover the joy of reading. 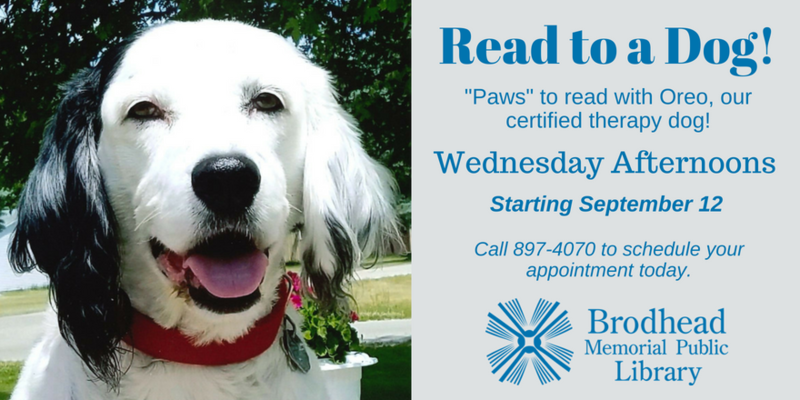 Sign up for your 15-minute session with Oreo by calling the library at (608) 897-4070. Registration is on a first come, first served basis. This program is recommended for elementary-aged children.